Welcome to the first entry in a regular blog on the A&E series Duck Dynasty. This show about a bearded redneck family and their multi-million dollar duck call business has become the unlikely king of cable ratings and has even beat broadcast giants like American Idol. The show is filmed in West Monroe, Louisiana, and its combination of backwoods humor and sprinklings of Christian family values have made it must-see TV in the Red States. I walked into my local Wal-Mart today in Lafayette, Louisiana to see a display set up featuring the four main family members, brothers Willie and Jase, crazy Uncle Si, and the family patriarch Phil, staring at me larger than life on pillows, throws, and t-shirts. Being around here, where people wear duck calls as fashion statements and get deer antler tattoos, gives me a front-row seat to see the Duck Dynasty phenomenon play out. As the fourth season unfolds, I’ll explore some of the themes of the show, talk about its relationship to Southern culture, and about the religious aspects of the program, which are brought in subtly, but decisively, in each episode. boys—Willie, Jase, and their younger brother Jep—are hooked by their wives into throwing them a “surprise” wedding in order to renew their vows. Uncle Si “the master distractor” is brought in to take Phil and Kay out on a “trip down memory lane” while the wedding preparations are put in place. Older brother Alan, a minister who has not been a part of the show, is brought in to officiate. Hilarity Ensues: By far the funniest character in the show, Uncle Si takes Phil and Kay around to places where, by his memory, Phil and Kay were supposed to have gone on dates in the early days of their relationship. Of course, Si’s memory has gotten a bit foggy in his old age. Si takes them to an abandoned house where he says Phil and Kay met, and a fireworks stand where he says there used to be an ice cream shop. Finally, Si takes the two to the woods where the couple once carved their names in a tree, and Phil and Kay are satisfied to see something that reminds them of their youth. Major Themes: The main theme here is the battle of the sexes. As Si, Phil, and Kay are out on their adventure, the younger men are reluctantly helping their wives set up the wedding. There’s a particularly funny scene where the Robertson’s neighbor, Mountain Man, a bearded yokel who moves slowly and talks in grunts, sets up an arbor for the wedding made of tree branches and deer antlers he’s collected. As usual, the men are no match for their wives, who somehow keep them on task and get the wedding put together. One thing I can attest to, the moniker “Miss” or “Miz” as in the mother “Miss Kay” is a common way to refer to women, even in professional settings, in the deep South. Likewise, “Mister” for men. In the restaurants and coffee shops where I’m a regular and they know my name (and they always know my name) they often refer to me as Mister Richard. My sense about the Robertson family is they’re both real Southern characters and very savvy business people. The fact that these supposed bumpkins come off as smarter than the average bear makes the show more appealing than other “redneck reality” shows like Swamp People. The Robertsons seem genuinely witty and self-aware. That being said, I think by the fourth season there’s not much left of their “real” lives to film. The situations—putting on a wedding in two days, just happening to find a tree marked by Phil and Kay in the old days—seem highly staged. At this point the show is more of a sit-com than anything else. What’s amazing is that Hollywood used to cast actors to play roles in shows like The Beverly Hillbilies and Green Acres. Anyone who has lived in the South can tell you there are more “real life” characters here than you could ever find on TV. The Christian Angle: The show usually ends with the family gathered around the dinner table as Phil asks a blessing over the food. One of the legends of the show (I overheard a grandmother telling her grandson this at O’Charley’s) is that the “Hollywood producers” wanted to cut the prayer out of each episode, but the Robertsons insisted that they end with a prayer or they would not do the show. I’ll research whatever I can find out about the truth or fiction of this supposed standoff between Heartland religious values and Heathen Hollywood secularism. In Alan’s blessing of his parents’ renewed vows, which makes up the “required” prayer, he mentions that all of the family were baptized in the creek behind where they are standing. Baptism in an actual body of water, by full immersion, done at an age when one can “come to Christ” or make a decision to be Christian, is still common practice in many rural churches in the United States. The family is Church of Christ, and their adherence to this denomination is one of the aspects of the show I’d like to explore. Phil has been described in various online biographies as a born-again Christian. And it will be interesting to see if other episodes refer to a “past life” for Phil before he became a committed Christian, husband, and father. The Wrap-Up: Reality series? Sit-com? Religious television? Anthropological study? Duck Dynasty is all of these. And I look forward to discussing the show this season, and learning from the observations of readers of this blog. 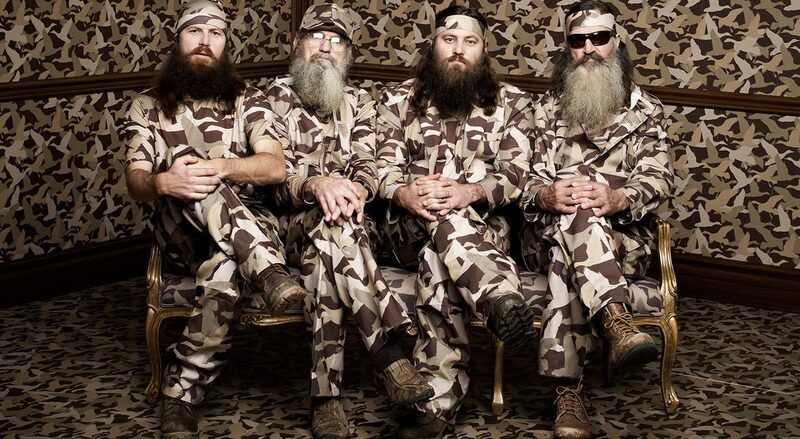 Duck Dynasty is on every Wednesday at 10PM Eastern, 9PM Central on A&E. “From your loins came four strong godly men.” Swoon.